I find myself doing the same things over and over again, and when that happens it's time to automate! After all a 'fire and forget' script that automatically gets Domain Admin has always been the dream right? Luckily for me a lot of other awesome people (see the Shout Outs section below) did all the hard stuff already. Additionally, Empire introduced a RESTful API a while ago making the creation of third-party scripts that interact with it a breeze. Before I continue, I'll take this opportunity for a rant: getting Domain Admin should NOT be the sole scope of your pentest and if it is you are doing it wrong. You should be focusing on post-exploitation, trying to find sensitive PII, documents etc.. anything that can clearly demonstrate to 'management' how much it could have impacted the organization if it were a real world compromise. However, having Domain Admin access does make life easier, provides additional value to the client and tends to make an impression on the Blue Team. Originally, I wanted something that could just take BloodHounds output, parse it, feed it to Empire and make it follow the 'chain'. However, BloodHound does not take into account (at least to my knowledge) paths that could be achieved using domain privilege escalations such as GPP Passwords in SYSVOL (I personally find that one an almost every engagement). I decided to just stick with Empire and automate everything using it's RESTful API. This would also give me the freedom to parse a module's output as I see fit and have more control over the overall logic and user feedback. What's it doing under the hood? The following flow graph details pretty well (I think) what DeathStar does better than I could ever explain in a blog post. 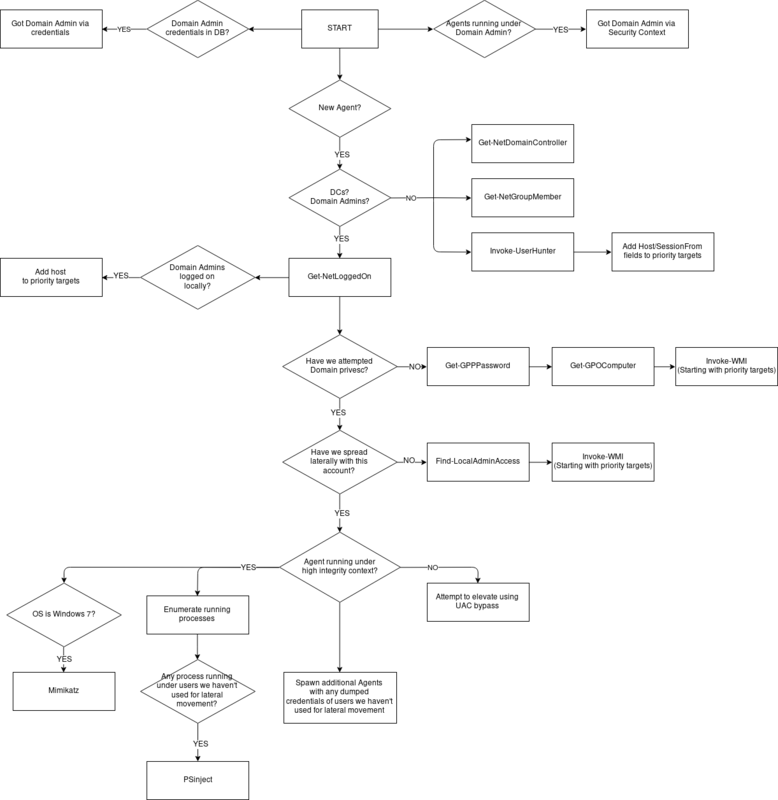 If you've pentested Active Directory recently, you should be familiar with pretty much everything in that graph. If not, feel free to hit me up and I'll be glad to answer any questions. Currently, for Death Star to work you're going to have to install my fork of Empire until this pull request gets merged and the changes get pushed to master. The fork contains some API and back-end database fixes for scripts that interact with the RESTful API. That will start Empire's console and RESTful API server. If all goes well Death Star will create a http listener and you should see a 'Polling for Agents' status: this means you're authenticated to Empire's RESTful API and DeathStar is waiting for that first Agent. All you need now is an Agent on a domain joined machine, how you do that is beyond the scope of this blog post. I'd recommend using CrackMapExec but I'm biased. Once you get that first Agent, DeathStar will take over and the magic will start. Here are a couple of videos of DeathStar obtaining Domain Admin in two different scenarios. One thing that I'd like to point out: although these two videos take advantage of credentials in one way or another it is possible for DeathStar to obtain Domain Admin rights simply by using a combination of local admin relationships and PSInject without ever using a set of credentials. There is so much more that could be done with DeathStar: more domain privilege escalation techniques could be added, more lateral movement methods, the logic could be fine tuned a bit more, we could do some post-exploitation and SPN shenanigans etc.. The current release is definitely a rough first draft. The game changer would be SMB Named Pipe pivoting. Once that's in Empire this will truly 'walk and talk' like a worm. One final point I'd like everyone to reflect on: I put this together in 3-4 days. Imagine what a bunch of much more smarter people than me could do/have already done with more time and resources (cough cough nation states cough cough). That's something that I think is particularly interesting.